Utah is home to many beautiful landmarks and has a relatively strong economy, so it comes as no surprise that so many people love to visit and live there. Some top-rated attractions in the state include Zion National Park, Arches National Park, and Bryce Canyon National Park, to name a few. According to Livability’s “Top 100 places to live,” Salt Lake City and Provo are both highly desirable for various reasons including booming economy and low commute time. In addition to having practically everything you’d need in a state, many of Utah’s cities are safe places to be in. 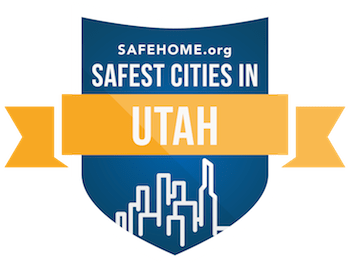 Of the 26 ranked cities in Utah, 12 of them received a safety score of at least 80 on our list. Lone Peak ranks as the safest city in the state, with a score of 88.63. Runner-up cities include Pleasant Grove (87.98), Spanish Fork (85.54), and Lehi (85.22) to name a few. Salt Lake City and Provo also made it to the list of safe cities. Provo received a score of 80.7 while Salt Lake City received a score of 34.17. The fact that SLC is a bigger city filled with many more people from different demographics and backgrounds may contribute to the lower score. To put things into perspective, it had an estimated population of almost 200,000 people, while Lone Peak had a little over 28,000 in 2015. The cities that ranked as the safest in Utah happen to be smaller regions, with a good chunk of people commuting out of their hometown into the metropolitan areas of the state to go to work and school. Overall on a national scale, Utah is not the safest state to be in, but given that it has so much more to offer, safety isn’t a huge problem. It falls in the middle when it comes to safety, which is reasonable considering everything else the state has — a strong job market, the beautiful four seasons, a plethora of outdoor activities, and so much more.